"A Family Friendly Burns Supper"
Burns Suppers are a celebration of the life and poems of Scotland's most famous poet, Robert Burns. Around January 25th, our family takes part in this celebration! When we've hosted our own parties, we celebrate more than the works of Robert Burns exclusively. We celebrate Scotland’s cultural and artistic achievements. This picturesque quote explains the attraction that people have with the Scottish people's value of independence and liberty. Burns Suppers celebrate the poetry of Robert Burns. Burns was born in 1759 in the town of Ayr. His father was a farmer. Even though Burns led a young innocent life, he later fell in with bad companions. Robert Burns early years were filled with tales of Scotland’s glorious history, stories about fairies, witches and goblins. He had a love for songs and nature. He is best remembered for his genius at capturing life’s simple joys and sorrows. Despite the centuries that separate us, his joys and sorrows surprisingly reflect our own. The meal for a Burns Supper is relatively straight forward. 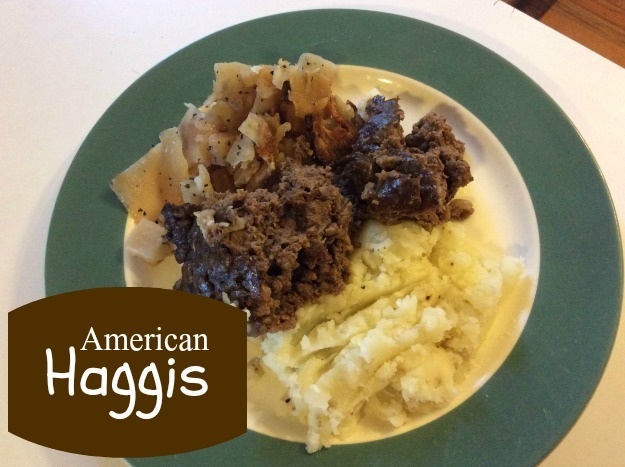 Serve haggis with neeps (turnips) and tatties (mashed potatoes) along each side. Serving a simple dessert, wine, and sparkling cider for the kids completes the meal. Ceremoniously present the haggis. It should be paraded in by the cook and laid in front of the person who will recite "Address to a Haggis". If a piper is available, he should lead the procession, if not turn on some bagpipe music. The haggis along with some Scotch should be in front of the person reciting. When the poem has been recited, everyone toasts to the haggis. After this the haggis is served along with neeps and tatties. I was able to adapt a combination of haggis recipes. It is hard to obtain some of the ingredients in America. I bought some delicious organ meats and suet from shepherdsongfarm.com. 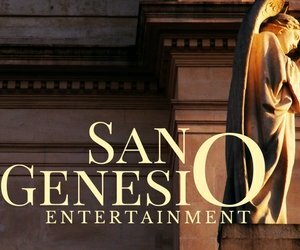 They are wonderful people with outstanding customer service. It shipped quickly and arrived frozen in a Styrofoam cooler via UPS. Toast the oats on a cookie sheet in a 350F oven for about 20 minutes, stirring occasionally. Saute the onion in the butter and allow to cool. Mix the spices, onion, chopped lamb, oats and lard in a large ziplock bag. Put in the freezer until quite cold (even stiff) but not frozen. When stiff, grind the meat mixture using a large die. Spread in a well greased casserole dish and bake uncovered at 375F until browned and well cooked, about 1 hour. This was so delicious that as I am typing this I am thinking how I need to prepare it again. It was so yummy. My kids loved it and ate every bit of the leftovers. Gently fry the bacon in a large saucepan for two minutes (VERY little oil, if any should be required). Build up alternative layers in the saucepan, starting with bacon with a little onion, followed buy a layer of swede (turnip) slices. Repeat process until all ingredients are used up. Salt and pepper each layer. Add a little water (2 tablespoons) simmer gently several hours over a low heat until cooked through. Don't stir but occasionally shake gently to keep from burning. Your job as host for a Robert Burns Supper is to keep the entertainment flowing. I'd suggest assigning songs and poems beforehand, but if your group is familiar with Burns, this may not be necessary. You can use this page as a sort of script or use it as a suggested schedule for your evening. Scotland doesn’t have a national anthem. For many years, Scots Wha Hae, a song by Robert Burns was considered it. This song is likely one that Robert Burns recorded and did not write. 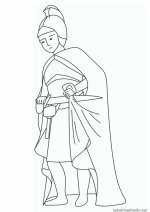 It probably dates back to the 1400s during the time of Robert Bruce and William Wallace. At this point someone performs Scots Wha Hae. It can either be played on the bagpipes or sung. Scotland the Brave is most commonly associated as Scotland’s national song. Even though it is not a song written by Robert Burns, we like to have a sing-a-long sheet prepared and have all join in on Scotland the Brave. It can also be played on the bagpipes. Next we like to have someone perform A Man’s A Man. A song whose import is as significant today as it was over 200 years ago. When Burns went to live in Edinburgh he expected to meet wealthy people who were deserving of great honors. What he discovered however was that many poor people were as or more intelligent and talented as their wealthy counterparts. Not all wealthy men are deserving of honor nor are all poor men deserving of disdain. This song is performed well with guitar accompaniment. My Hoggie- This is very easy for children to memorize. We watched YouTube videos to get the pronunciation right. 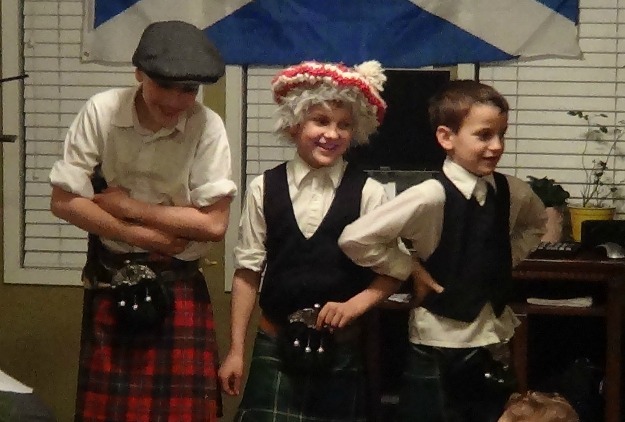 Often times we work our Burns Supper into our homeschool studies. For this reason we usually plan on presenting some Scottish history and perhaps a book review that pertains to Scotland. Teen A presented us with a brief report followed by a song on the Massacre of Glencoe. Though the song was not written by Robert Burns, the event is a graphic depiction of the political environment of the clans in the decades leading up to the Jacobite Uprising of 1745. 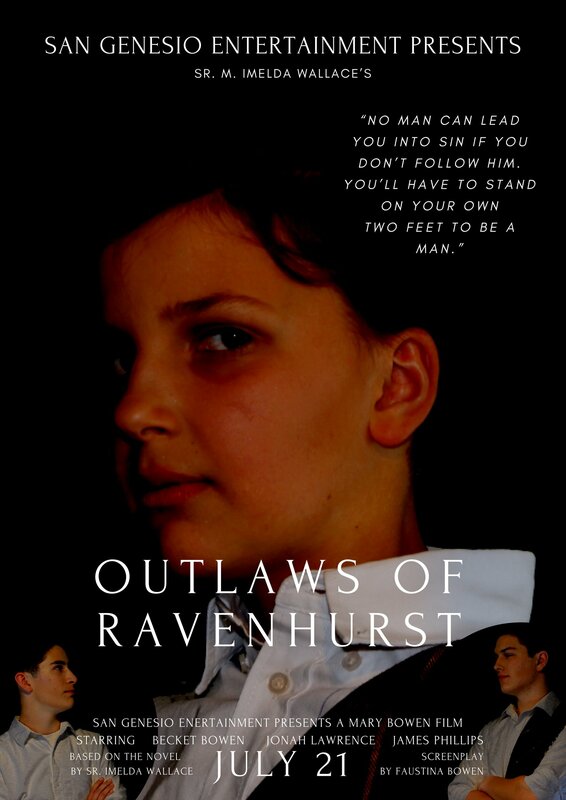 Two excellent book choices if you'd like to include some book reviews are Kidnapped and The Outlaws of Ravenhurst. Last year BeeJay gave a review of Kidnapped, a book whose setting is Scotland in 1751. This Robert Louis Stevenson story reels the reader into this tumultuous period in Scotland’s history. At this point, it would be wise to move back into some more serious and insightful Robert Burns' poems. An excellent choice would be Burns “farewell dirge to (his) native land”. Deep in debt, the Ploughboy Poet, planned on traveling to Jamaica to work in the slave trade. He wrote Farewell song to the Banks of Ayr a poem dedicated to his hometown. On the urging of his friends, Burns published his works and was able to live the rest of his life in Scotland. This poem is beautiful and it is really a treat to hear when performed well. We usually throw in a few of our favorite Scottish songs. They can be performed by guests or sung as a sing-a-long. By Yon Bonnie Banks, Loch Lomond- The words to this song are attributed to a captured Jacobite soldier. He is talking to his friend who is being released and returning to Scotland. The high road is the journey back to Scotland and the low road refers to a spiritual road that the doomed prisoner will take back to Scotland after he is executed. The Green Fields of France - is a song about the reflections of a modern day visitor to the World War I graves in Northern France. This song was written by a Scottish Australian, Eric Bogle. Let your guests continue to perform as long as they are willing. When the performances begin to taper off, we like to conclude with a short quip about the end of Burns life and the best known of his songs. Burns was married in Edinburgh but soon got tired of city life and moved to back to the country, where he hoped to live happily ever after. Sadly, Burns yielded too easily to temptation to ever be happy. The Bard of Scotland died a poor man in 1796 at the age of 37. The most famous of Robert Burns’ songs is sung throughout the world at the stroke of midnight on New Year’s Eve. Auld Lang Syne can be translated into English literally as "old long since". Singing this song very quickly became a Scottish custom that soon spread to other parts of the British Isles. As Scots, English, Welsh and Irish people emigrated around the world, they took the song with them. A sing-a-long of Auld Lang Syne is very appropriate ending for the entertainment part of the evening. Allow the evening dwindle on its own. If you follow our itinerary, you'll spend at least an hour on structured performances. The rest of the evening can be enjoyed in a more impromptu and relaxed manner. A Burns Supper is very fun. We hope it becomes an annual event at your home the way it has at ours. Let us know what you think. Have you had a Burns Supper that you'd like to share? Do you have any questions or comments. We love hearing from you.